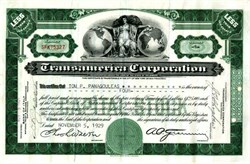 Beautifully engraved uncancelled stock certificate from the Transamerica Corporation. 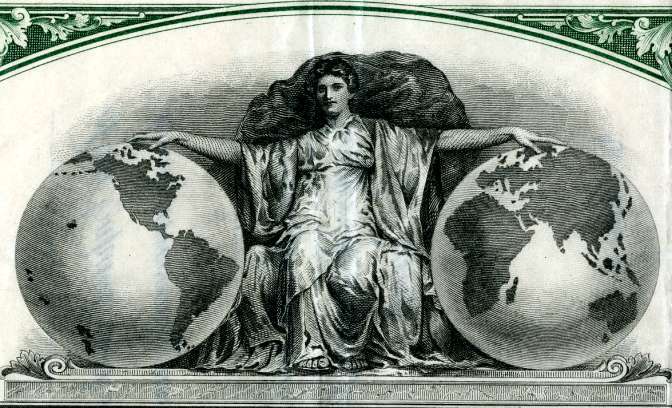 This historic document was issued by the Security Banknote Company on September 10, 1929 and has an ornate border around it with a vignette of an allegorical woman between two globes. The certificate has the printed signature of the company's president, A.P. Giannini. Amadeo Pietro Giannini, also known as Amadeo Peter Giannini or A.P. Giannini (May 6, 1870 � June 3, 1949), born in San Jose, California, was an American banker who founded the Bank of America. Giannini's parents were Italian, from Liguria near Genoa, immigrants to the United States. He attended Heald College in San Francisco, California. Giannini opened the Bank of Italy in a former San Francisco saloon on 17 October 1904. Deposits on that first day totaled $8,780. An early difficulty to overcome was the San Francisco earthquake of 1906. Giannini was forced to run his bank from a plank across two barrels in the street for a time. Giannini made loans on a handshake to anyone who was interested in rebuilding. Years later, he would recount with pride that every single loan was repaid. By 1916 Giannini had expanded and opened several other branches. In 1928, Giannini approached Orra E. Monnette, President and Chairman of the Bank of America, Los Angeles about a merger of the two financial institutions. Upon finalizing the merger, Giannini and Monnette concurred that the Bank of America name idealized the broader mission of the new bank. The new institution continued under Giannini's chairmanship until his retirement in 1945; Monnette retained his Board seat and Officer's position. Prior to Monnette's creation of the Bank of America Los Angeles network, most banks were limited to a single city or region. By diversifying the scope of community that the BoA served following its merger, the insitution was better prepared to ride out minor, local economic issues. Giannini is credited as the inventor of many modern banking practices. Most notably, Giannini was one of the first bankers to offer banking services to middle-class Americans, rather than simply the upper class. A liberal in a conservative field, Giannini and his bank helped nurture the motion picture and wine industries in California. He loaned Walt Disney the funds to produce "Snow White", the first full length animated motion picture. In the depths of the Depression, he bought the bonds that financed the construction of the Golden Gate Bridge. During World War II, he bankrolled industrialist Henry Kaiser and his enterprises which supported the War effort. After the War, he visited Italy and arranged for loans to help rebuild the war-torn Fiat factories. Giannini founded another company, Transamerica Corporation, as a holding company for his various interests, including Occidental Life Insurance Company. At one time, Transamerica was the controlling shareholder in Bank of America. They were separated by legislation enacted by Congress in the 1950's to thwart Giannini's ambitions. A middle school in San Francisco is named after Giannini, as is the Giannini Foundation of Agricultural economics and the building that houses the Department of Agricultural and Resource Economics at the University of California, Berkeley. The U.S. Postal Service honored Giannini's contributions to American banking by issuing a postage stamp bearing his portrait in 1973. A ceremony to mark the occasion was held near his former home in San Mateo, CA. TIME Magazine named A. P. Giannini one of the "builders and titans" of the twentieth century. He was the only banker so named to this distinguished list of the 100 most important people of the century. American Banker Magazine recognized him as one of the five most influential bankers of the twentieth century. In 2004, the Italian government honored Giannini with an exhibition and ceremony in Parliament to mark the centennial of his founding of the Bank of Italy. The exhibition was the result of the collaboration of the Ministry of Finance, the Smithsonian Institution, Italian Professor Guido Crapanzano and Peter F. De Nicola, an American collector of Giannini memorabilia.